Another perfect Fall day with lots of sunshine and trees with every shade of rust, orange and gold leaves that you can imagine. The kind of day you could sit on your front porch and just ENJOY! I didn't accomplish a great deal today. I have plenty to do with the orders on hand. But, my morning got off to a rocky start and I never quite recovered. Woke up way before daylight and just didn't feel too good. Kinda like that all day until the evening rolled around. It was around dinner time that I started feeling better. Bill & I had our usual pasta tonight, plain old spagetti ( his favorite) with meat sauce, tossed salad & garlic bread. We have some type of pasta every Wednesday without fail and we have had this ritual for years and years. LOL!! My family knows NOT to eat pasta for lunch on Wednesdays, cause regardless they'll have it again for dinner. One meal during the week that I never have to ponder over, it's already planned. The special of the week on my web site is changing DAILY until Halloween! You never know what it might be and when it might change. What Fun! Tomorrow, I'll have more to say and pictures to post, until then. Well, finally decided what color I wanted to paint my little (red) chair! It was a tough decision for me. LOL! Had it been for any other room....it would have been black without a doubt. But, with the colors in the bathroom, I didn't think I would be satisfied unless it was blue. So, I found a navy that I thought would work & this is what I came up with. First, I sanded it and removed most of the flaking paint. Then I sprayed it with a primer and after ample drying time, the navy blue. It still wasn't the look I wanted, so I sponged it with burnt umber. Just what it needed! I love the way it looks now. Brownies are ready and I'm off to get them out of the oven! A Few Plans For The Rest Of The Week: Learn to use more stitches on my sewing machine & maybe watch the Grandkids on Thursday. Man, just went outside a few minutes ago & it feels more like Winter than Fall. The temperature has really dropped since the sun went down. It was overall a nice day in K-ville...a great day for homemade chilli. The only problem is it's really hard to make enough for just 2 people! We have enough left to last for days! Oh well, maybe Cait will eat some tomorrow. 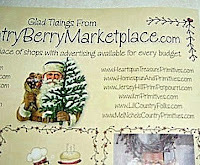 In the next few days there will a few things on my web site that I have on hand, ready to ship. Normally, everything is made to order, so it's really nice that there are items that can ship right away. Some of these treasures were actually left over from a craft show. And most will be wonderful bargains, so look for these in the coming days. This is one of the many goodies that will be available. Off to change the special for the week on my web site. For some reason, I totally forgot about it today! LOL !! It was a much nicer day in K-ville today, although it is really quite chilly. I finally had a chance to get back to my flower garden and finish up with my pansies. The mulch had been sitting there all week begging me to spread it all around the scrubs & flowers. So, today I could take it no longer, put on my gloves and got down to business! What a difference with everything in place. And as far as I can tell, not a single one of the 72 pansies has died. They have some growing to do, but it probably won't take too long. I'll try to take a picture tomorrow. I worked on some new Christmas goodies this morning. There will be pictures in the coming days. I'm gonna sleep on it and see what I think in the morning. Would really like to paint it tomorrow and finish up in there. You know all these folks making comments are entered in my Web Site monthly contest. And don't forget to sign my guestbook at the botton of the page.....it counts as an entry too!!! Today, I woke up to a cold, rainy day in K-ville. It has been one of those days that you just want to stay home and do nothing. I worked on orders this morning, but took off this afternoon to Greensboro on a hunt for fabric. Didn't find what I was looking for, but I did find a few things that I needed. The Favorite Find for today is a (middle size)Chair that I found at a local consignment shop. It's sort of painted red now, but I want to re-do it or something to use in my hall bathroom. It doesn't match the way it is. The bathroom walls are a yellow/gold color with a burgandy, navy and gold check shower curtain. The rug and towels are navy blue. I think it would be the perfect size to hold a few prim goodies. Any & all ideas will be greatly appreciated! I am going to run for now. 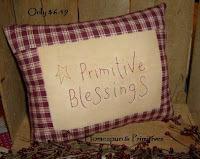 It's Thursday 10:30 or so and I am watching ER & making homespun pillows! My day isn't over yet, although it won't be long. I usually stay up late & watch the old Frasier reruns on Lifetime, but I don't know if I can stay awake that long tonight. but they are all finished now. And now I can move on!! 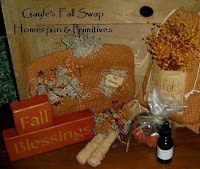 I didn't want to post the pic until I was sure that Gayle, my Fall Swap partner had received her package of goodies. She received it today, so wanted y'all to see what I sent.... what do you think? Everything was handmade by me and I hope she was pleased with the items that I chose for her. This was the 3rd swap that I have participated in & they are so much fun! If you haven't ever done one, give it a try sometime. You most likely won't be disappointed! My package arrived today from a FALL SWAP that I'm participating in over at Diane's community. (http://aprimitivejourney.proboards106.com/) You should really check it out if you get a chance. A great group of gals over there, and it is so much fun to see what's going on! 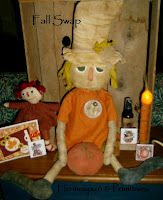 http://www.buttoneyed-annie.com/store/Default.asp sent me this fabulous collection of Fall goodies! I've never met the lady, but she was right on the mark with all my favorites! The scarecrow doll is just wonderful! We named him Sam. The Annie doll has already been added to my Fall tree. The spray is one of my all-time favorite scents, Blueberry Muffins! The little candle light is such a clever idea and will be going on my crock bench in the foyer. Even the card is a special keepsake & just lovely. I know it must be handmade and I've been looking around the house for a frame to put it in. I have the perfect spot for it on my sofa table. The little magnets are already on my fridge as well! Wish y'all could see all this! Needless to say, I am thrilled with everything and Thank you so much Robin! Outside My Window... My two little trees that Hubby & I planted yesterday. I am thinking... I am so tired of working all the time. I am thankful for... my fabulous husband. From the kitchen... I have tea-dyed "stuff" all over the counters & in the oven. I am wearing... one of my red T-shirts and jeans. I am creating... pillows, hearts and blocks. I am going... out to eat today! 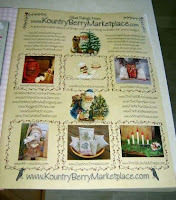 I am reading... Country Sampler magazine. I am hoping...that I get caught up on orders this week. I am hearing... just background noise from the TV. Around the house...I need to clean up a few areas. One of my favorite things...today is Dove milk chocolate candy bars. A Few Plans For The Rest Of The Week: just working on orders & cleaning up my house. Today was a very productive day at the the Freshwater's house. It was a beautiful day to be outside, so Bill & I decided that we would work in the yard. We have been planning to do a few things, but never seem to have the time. We made the time today, and it was so nice! I had bought 72 pansies at the Farmer's Market the other day, some little shrubs at the local nursery and 2 Maple trees at Lowes! As of this evening, everything has been planted! What a chore. But, a lot of fun for us too! I think we both decided to leave the "hole digging" to someone else next time. LOL!! The red clay around here is very difficult to dig & plant in. But, we did it and I will finish up with the mulch tomorrow. Looks great so far! On to other things...this is a new project that I am working on for the Holidays. The recycled quilt is perfect for Christmas goodies like this jumbo mitten and stockings that I'm working on. These will all be OOAK! Today was the perfect Fall day in K-ville. Lots of sunshine with just a slight breeze. I spent the morning in Greensboro looking for supplies, mainly solid black homespun. With Halloween around the corner, it's impossible to find....and I need a lot of it. So, I ordered a bolt of it & got only 9 yards. Bummer!!! Already used that up. Several months ago, I bought this wonderful new computer sewing machine because I knew mine was on its last leg! Finally, today after trying everything I could think of to get it to sew~my old Janome just couldn't go any further! 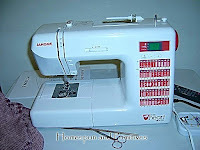 I have had it since (maybe) 1995 and let me tell you it has done a ton of sewing over the years. So much that the feed dogs are worn down!! That is a lot of stitchin'!! So, I spent the afternoon learning to use the new one. What a difference in technology! This new one can almost sew by itself. Lots and Lots of fancy stitches~just have to learn how to use them! LOL!! There is a wonderful blanket stitch that I can't wait to use. It actually can be done in both directions~pretty nifty. Oh, another thing it's RED for the heart truth! Definately a selling feature for me! Gonna go play for a little while longer. 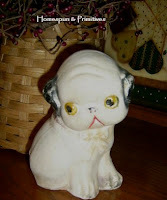 This is one of my most favorite finds! This vintage bread box was another great piece found by my Mom & Dad at a yard sale or thrift store. I had to re-do it in my color to match my kitchen, but it was time well spent! I had to strip it down, paint it burgandy, sand it & antique it to look old. That wasn't an easy task with the louvered door. It looks fabulous sitting in the corner with some other handmades. The glass behive jar is actually a really cool oil lamp. 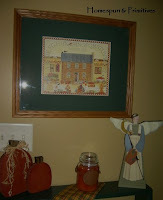 The olde crowe is one of my creations, as is the heart quilt & shelf sitter blocks. The metal embossed square came a vender in Walnut Cove. I love the way it all goes together. It's already Thursday and I haven't accomplished near what I needed to for the week. Decided to stop what I was doing and make Country Ham, eggs and biscuits for dinner. Sometimes, we just need a change and breakfast for dinner is a good choice for a rainy, chilly Thursday. I'm finished up this jumbo (about 16 x 11 inches) sheep pillow today & am so pleased with the way it turned out. A really nice size that you could use on a small chair, shelf or even hang on the wall. It's made from tea dyed muslin with painted face and button eye. 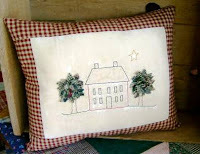 The homespun star is hand-stitched on & the rusty bell is attached with a tiny piece of wire. Just Too Cute!! Well, the biscuits are almost done and I still have a few things to do before bedtime. Look for this soon on my web site! It was a nother Fall~ like day in K-ville, until this evening when it started to rain. The grandkids came by for a short & unexpected visit today! They liked the baby pumpkins! I tried to get some outside pictures of my Fall decorating, but it was still a little gloomy to get any really good pics. This is the jest of it & I will try to get some more when the weather gets a little brighter. I will probably keep adding things as I find them anyway, so y'all can keep updated. Corn Stalks on the Lamp Post along with the 2 baby pumpkins! Looks like the grass needs mowing. LOL!! It grows like crazy with this weather. 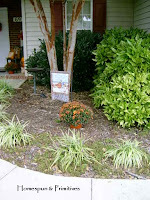 Next, is my Fall garden flag and a beautiful Mum that I found at our local Farmer's Market. We have a fabulous Crepe Myrtle tree that is huge. The bark on it is so unique. A friend of mine used some for a scrapbooking project. Front entryway~I made the wreath, pillows and the sign. It really says WELCOME to everyone! Gonna run for now, but I'll try to get more pics soon. For years and years, I decorated this wonderful woodland tree for the Holidays and for everyday too. It stayed up year round in my house. When the kids grew up and moved on and we actually moved to a smaller house, it wasn't fun anymore to bring out all the decorations. So, I didn't make the effort. 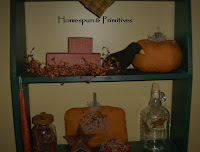 But, I decided this year after a long while of NOT doing any decorating for Fall that I would try my hand at it again. I was just talking to my friend Bobbie telling her it's so hard to get a picture that shows how wonderful this tree really is! It stands over 7 1/2 feet tall & fits perfectly in the corner of my foyer. This is the first thing you see when you walk in my front door. A real "conversation starter". The ornaments are varied from wood to glass with leaves and pip berries to fill in. 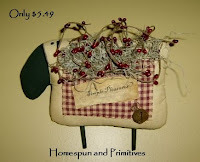 Little ties made from homespun are a nice prim touch. A few rusty stars and pinecones are permanent items as are the mini white lights that we turn on at night. 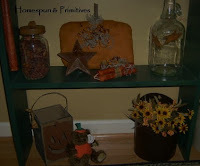 The pumpkin is one my own creations! Thought you might enjoy seeing it! Outside My Window... A beautiful day with lots of sunshine and my Fall garden flag barely swaying on the pole. I am thinking... of making something for a special friend who is feeling blue. I am thankful for...my very special family and all the quirky things they do. From the kitchen... trying to decide what to make for dinner. Mondays are usually something simple like take-out chicken or maybe soup & sandwiches. I am wearing... my favorite pair of jeans, one of my numerous red t-shirts & a pair of red shoes. (No more capris & flip flops for awhile). 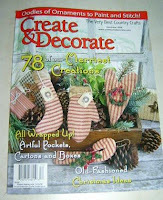 I am creating... some new goodies out of wood, homespun, calico and recycled quilt for my Christmas line. 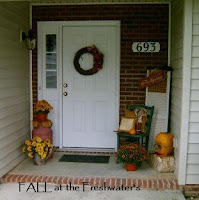 I am going...to the Farmers Market to look for corn stalks, pumpkins and pansies to finish decorating my yard for Fall. I am reading... nothing in particular right now, mainly magazines, but I started The Memory Keepers Daughter while on vacation and hope to finish it soon. I am hoping... to always be this content & happy with my life. Around the house...lots of decorating projects to finish up, a little painting, window treatments & swapping a few things around from room to room. One of my favorite things... to sit, watch TV & relax with my very fat cat, Rufie in my lap, purring his heart out. A Few Plans For The Rest Of The Week: to finish up orders & get my CLOSET cleaned out once and for all. Make a run to Goodwill to drop off some things, go to the grocery store, craft store, etc. Another fabulous day in K-ville! I would say that the weather has been almost perfect for the past few days. A few friends of mine did craft shows this weekend. I didn't go to either, but now I kinda wish I would have. Retha from Cinnamon Creek Primitives did really well at the Brushy Mountain Apple Festival. My other friend, Bobbie hasn't called yet to let me know how she did in Lake Norman. I'm really looking forward to going to the Autumn Leaves festival next weekend. Retha has a booth there as well. I have been several times in the past and it is a fabulous show!! Can always find something to bring home with me from there. LOL!! I have been meaning to do this, but wanted to make sure it was ok with the owner first. I finally remembered to ask her about it today.... So, I'm doing it before I forget! LOL! I won free advertising from Tina at http://www.crowscreekcrossing.com/. All I did was ask a question on her blog. My name was put into a hat & I won! Thank you so much Tina! I will continue the advertising even after my free months are up. Tina has several web sites and blogs, including these. but my favorite is http://www.junctionjournal.com/. There is tons and tons of FREE information about blogging and web sites do's and don'ts. I frequently check it out and always run across something new! Check out all of them!! Believe me, it's time well spent! Me and a dear friend made the crock bench several years to fit this space. Sorry for the glare on the Fall picture. I took tons of pics trying to get it right and just couldn't. Most of the "stuff" here was made by me. The wood pumpkins & tea towel, I made yesterday along with the Fall Blessings shelf sitter blocks, the calico pumpkin & flat pumpkin. Cait found the clear jug wrapped with rusty wire and a star at a flea market when she was like 15. The grungy orange tapers were from last week. I have only a few sets left. They really turned out fabulous! Antique Slicer? This is another one of my favorites that my Dad found at a yard sale, I think. I know that he picked it up for nearly nothing. He had the intention of re-selling it, and had no idea that I would fall in love with it. I have had it for several years now and never seem to get tired of it. It has lived several different places in my house, but at the moment it's on my Kitchen hutch. Most of the time it has a big, grungy candle sitting in the middle section to cover the blades that are still intact. Did I mention that it is in wonderful condition made from beautiful oak wood in a fabulous finish. What do you think of it as a candleholder?? It was a beautiful day in K-ville today. Almost too nice to stay indoors! I worked on orders early in the day and then decided to go visit my Mom & Dad. I have been planning to go all week and just got around to doing it today. I must say that it was INTERESTING trip! They live about 45 minutes away ( not sure how many miles) in a small community out from High Point ( the Furniture Capitol of the world). Anyway, there was only ONE station that had any gas!! It is getting a little serious in our area. Some of the stations are going for days at a time without any gas at all and then only getting 1/2 of what they need. I don't know...I may be conserving for another few weeks. Gonna run for now and check out this new show on Sci-fi called Sanctuary with Amanda Tapping (from Stargate-SG1, my all time favorite show). I'll post pics tomorrow of my Fall decorating and more. Just finished up this candle box and I think it turned out fabulous! I think it will one of my homemade favorites! I actually made one for myself! Comes with the three grungy candles, but I love the little homespun bag sitting with it....maybe I will soon offer the little bags on my site. Today, was another cool, Fall-like day in K-ville. Tomorrow I am going to decorate my porch. Just haven't had time this week. Can't believe that tomorrow is FRIDAY already!!! There are still random gas shortages locally. It gets a little scary when all the stations are out. Hopefully, this will be the last week for this. I have post-poned going to Walnut Cove & to see Mom and Dad, until things get a little better. Didn't leave the house for several days and that's a little unusual for me! Just trying to do my part...and conserve a little. New pics tomorrow, so be sure and take a peek! After many, many, many entries for the September 2008 Contest, Congratulations go to Janet Canterbury of Norfolk, VA. She is the winner of a $25.00 gift certificate to http://www.homespunandprimitives.com/. YIPEE! I'll let you know what she chooses. I would like to say a special Thank you to all that entered the contest in September and for all the kind words. Be sure and check out the Contest for October and get your name entered! No purchase necessary! And it's an easy one! !